Erica Sehl was born on 8 January, 1902, into the family of the manufacturer Woldemar Sehl. In April 1918 she finished gymnasium (grammar school) in Saint Petersburg as an external student, and in June 1921 she completed classical gymnasium in Riga. In the fall of 1921, Sehl commenced her studies at the Herder Institute in Riga (Herder Institut in Riga). After finishing the spring semester of 1922 in Riga, she moved to Freiburg im Breisgau on the advice of Kurt Stavenhagen, and began studying at the University of Freiburg in October of that year, where she took courses with Edmund Husserl and Martin Heidegger. Sehl remained in Freiburg for WS 1922/1923 and SS 1923, transferred to Munich for WS 1923/1924 and SS 1924 (at which time she studied with Alexander Pfänder), and returned to Freiburg for WS 1924/1925. She continued taking courses off and on in Freiburg until WS 1927/28. In the summer of 1930, Sehl transferred to the University of Königsberg, where she obtained her doctoral degree (Dr.phil.) under the supervision of Heinz Heimsoeth with her dissertation Kritische Studien zu Locke’s Erkenntnistheorie. Her dissertation was dedicated to Husserl. From SS 1931 until the winter of 1933, Sehl continued her studies at the University of Vienna and the Herder Institute in Riga. 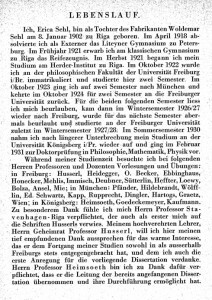 In preparation to become a high school teacher, Sehl finished courses in physics, mathematics and religion in German Institute for Pedagogy in the winter of 1932. Earlier that year she had already become a lecturer in Riga, where she taught Latin and the history of Ancient Greek literature. In 1933 she obtained a candidate degree in theology. In the spring of 1934, she began work as Stavenhagen’s assistant at the Herder Institute, and in August 1934 she submitted her habilitation thesis Historisch-kritische Studien zur Entstehung des Empfindungsproblems. At the end of October that same year, Sehl applied for a position as Privatdozentin at the Herder Institute in Riga. Evading the ordinary protocol of the Herder Institute whereby a committee of three experts from the Institute is needed for the habilitation, Stavenhagen instead sends Sehl’s work to two examiners in Germany: Heidegger and Pfänder. 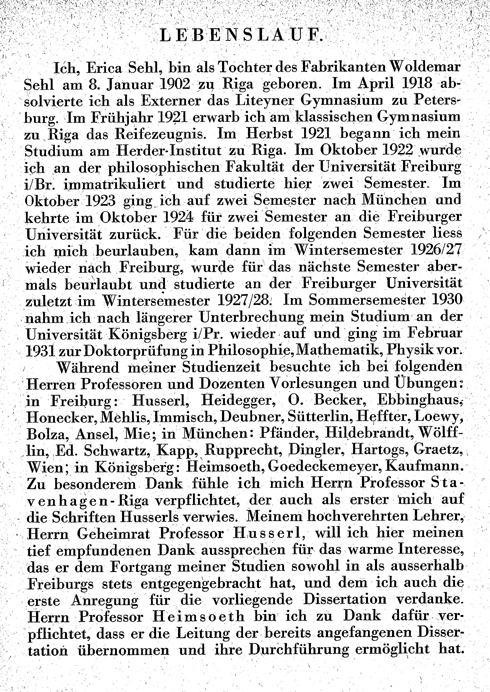 In a letter addressed to the Dean of the Institute’s Faculty of Philosophy, W. Wulfius, dated 12 December, 1934, Stavenhagen indicates that it is impossible to find adequate experts at the Institute to evaluate Sehl’s work. He therefore proposes to invite two “external” examiners (Pfänder and Heidegger), with himself serving as the third examiner.